On Monday, Council member Debora Juarez intends to introduce an ordinance placing a one-year moratorium on commercial development within the Aurora-Licton Springs Urban Village. Juarez has been working with the ALUV to “accelerate and enact HALA proposed zoning changes along the Aurora Avenue corridor in advance of the vote for city wide HALA changes sometime in 2018.” The HALA changes would move the neighborhood toward “a vibrant residential community” with multifamily housing, pedestrian-oriented retail and services, and open space. 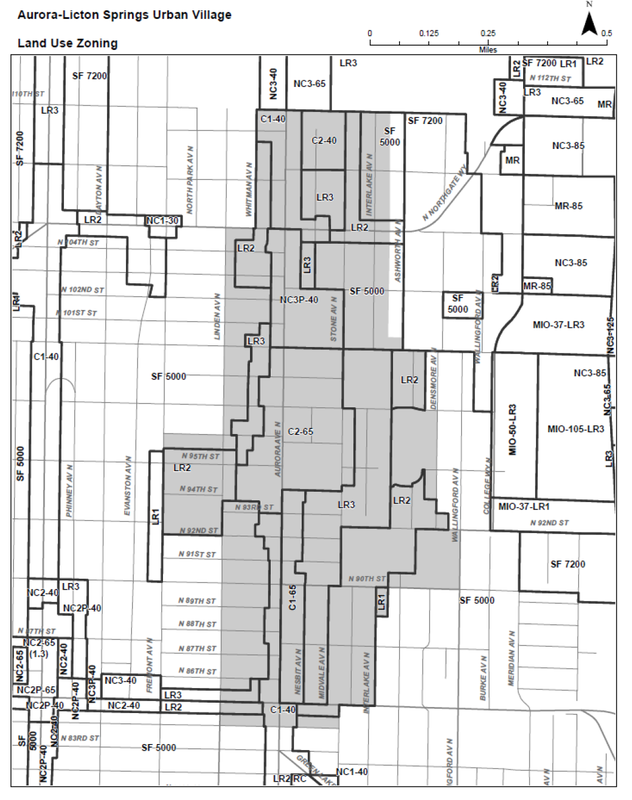 According to the draft legislation, since 2014 half of permit applications within the Commercial 1, Commercial 2, and Neighborhood Commercial 3 designated zones in the urban village have included uses, including “mini-warehouses,” that are inconsistent with the intended direction for the neighborhood. There is concern that if the trend continues it will set back future efforts to reshape the neighborhood in the desired direction. The moratorium doesn’t apply to any development project that is already in the permit process or has received its permit by the effective date of the ordinance. Normally, a moratorium of this type would require a SEPA review and a public hearing before it could be adopted. To get around that, the legislation is a self-declared “public emergency ordinance” that is “necessary for the protection of the public health, safety and welfare.” That excuses it from the SEPA review under Seattle Municipal Code. It also excuses it from holding a public hearing before the ordinance is adopted, though under state law it must hold one on the moratorium within sixty days of its adoption. A moratorium is normally limited to six months, though it can be extended to one year if it is accompanied by a work plan for further studies (such as the planned schedule for the rezone above). Juarez is stretching the definition of “public emergency” in establishing the moratorium, arguing that prohibiting permitting of car dealerships and mini-warehouses is “necessary for the protection of the public health, safety and welfare.” Passing the ordinance will certainly expose the city to lawsuits from commercial developers whose development rights are being curtailed. Given the direction of the long-term plans a moratorium makes sense, but using emergency authority to rush it through, skipping the public hearing and SEPA review is eyebrow-raising to say the least. None of its findings-of-fact and declarations in the legislation explain how mini-warehouses are a threat to public health, safety and welfare — they simply say the prohibited uses are “inconsistent” with the neighborhood plan, which has not yet been codified in the city’s land use code. The public hearing and SEPA review requirements are there for a reason: to stop the government from making exactly this kind of land use change quickly and quietly without public transparency. Juarez is fast-tracking the legislation, and since it’s budget season and committees aren’t meeting, the legislation would be introduced on Monday afternoon, skip deliberation in committee, and come before the full Council for final adoption next Monday. So she’s down with letting in a bunch of addicts who steal and befoul the neighborhood with unsafe and unsanitary campsites that exist around the sanctioned camp, but she’s not cool with businesses that provide jobs for people in the area. Got it. a) there’s no evidence the homeless people in the neighborhood are coming from somewhere else. The vast majority of homeless people becamme homeless here, and tend to stay in the neighborhood where they became homeless because they have ties (job, family, friends) there. b) there are many kinds of businesses that the moratorium doesn’t apply to, and in particular pedestrian-friendly retail businesses. To be clear: the planned MHA rezone in Aurora-Licton Springs makes a ton of sense to “reclaim” the neighborhood, and a moratorium of some sort for he next year while that gets put in place is not a terrible idea. My only objection is the use of an “emergency” exception to put it in place immediately by bypassing the transparency and review requirements normally required for land use decisions. There’s no evidence other than asking them and hearing they are from out of town, or at least the area. That’s been my experience, anyway, so color me anecdotal. It’s the first question I ask folks when I talk to them in their tents on my walks, or when they are sitting on my steps. The “study” you are quoting (that took place during the One Night Count, IIRC) has methodology so faulty it’s hard for me to hang my hat on…I really wish we had a solid survey, conducted by disinterested parties, to lay this whole question of “where are they from” to rest. It’s used by both sides to further agendas and ultimately we just need to provide assistance — including jobs — to help people up. I appreciate your laying out in more detail what types of businesses this addresses. The one night count, and the earlier study, were conducted by a reputable firm that has done this work in several cities and counties. Their work in other places, as well as the studies done by other organizations in cities across the US, show consistent results: the majority of homeless people became homeless in the city where they are now. If you have specific critiques of their methodology, I would love to hear them. I guess the folks in the unsanctioned camps around Licton Springs are outliers. Thanks! 2) Self reported surveys generally have bias when there is an answer that is more socially acceptable (like being from here). 3) it doesn’t break out sheltered vs unsheltered homeless. And if migration isn’t happening why was Seattle’s homeless population up 30% last year while other parts of King County were almost flat? 1) A lot of people become homeless as a result of going to jail. And I don’t understand the point you are making about why “in jail” would invalidate the stats about where people became homeless. 2) You’re assuming that among the homeless population it’s more socially acceptable to say you’re from here. 3) I don’t understand how sheltered vs unsheltered biases the stats on migration of homeless people to the city. As for why Seattle’s homeless population is up more here: because the housing affordability crisis is more acute here, and continues to get worse. I imagine it also has threshold effects too, rather than a continuous rise in homelessness directly proportional to housing costs. Wondered what happened? It was mentioned at briefing, but I didn’t hear it at full council. If you caught any info, love to hear it. Thanks! The only action that was expected today was to add it to the Introduction and Referral Calendar. That was done. The real discussion will be next Monday when it comes in front of the full Council for a vote. Thanks. I am clearly not sure what the implications of emergency meant. Maybe, no committee meetings and/or bringing in during budget season? Declaring it an emergency allowed them to skip the SEPA review and the required public hearing for land use decisions. Referring it to the Full Council instead of to committee allows them to skip the committee deliberation process. It is no doubt a good thing. My concern was the way they did it, and didn’t even acknowledge that they were bending the rules to make it happen quickly.